The holiday season is near and it’s that time of the year where I put my hands deep into biscuit dough. It’s a family tradition from my childhood, where we all get busy in the kitchen baking all kinds of lovely Christmas biscuits – or bredele, as we call them in my home region. After the Leckerli and Spritz biscuits I shared with you last year, let me introduce you to the chocolate-dipped almond horns. Also called mandelhörnchen in German, these are wonderful almond-based cookies with a crisp outside and a moist and chewy inside. If you love almonds, this recipe will become a favorite of yours! A very dear friend of mine, Lucie, is about to leave Finland to move back to Paris with her family. I’m feeling sad to see her leaving, though grateful for our true friendship, which I know will remain no matter the distance. We both belong to a French-speaking club in Helsinki, and last week we all got together for a lunch party: good food, lots of laughter and a few tears too. Everyone brought a delicious dish. I baked a crusty gluten free bread and a batch of these chocolate-dipped almond horns. Quickly nothing was left in my cookie box, and I promised to share the recipe, so here it is! Preparing almond horns is very easy. All you need to do is add all the ingredients at once and mix them into a sticky dough (and we, gluten free bakers, know how to deal with sticky dough, right?). No cookie-cutter needed, just your slightly wet hands to shape the biscuits into crescents, before rolling them in slivered almonds. Voilà! The only challenge is to resist the urge to nibble small pieces of the raw dough. I added a twist to my dough by flavoring it with grated tonka bean. If you are not familiar with tonka bean, it is actually a black wrinkled seed, the shape of an olive pit. Its wonderful aroma is somewhere between vanilla, almond and caramel. If you don’t find tonka bean, it’s ok, you can leave it out and your biscuits will be delicious anyway! Don’t worry about the dimensions of the biscuits. 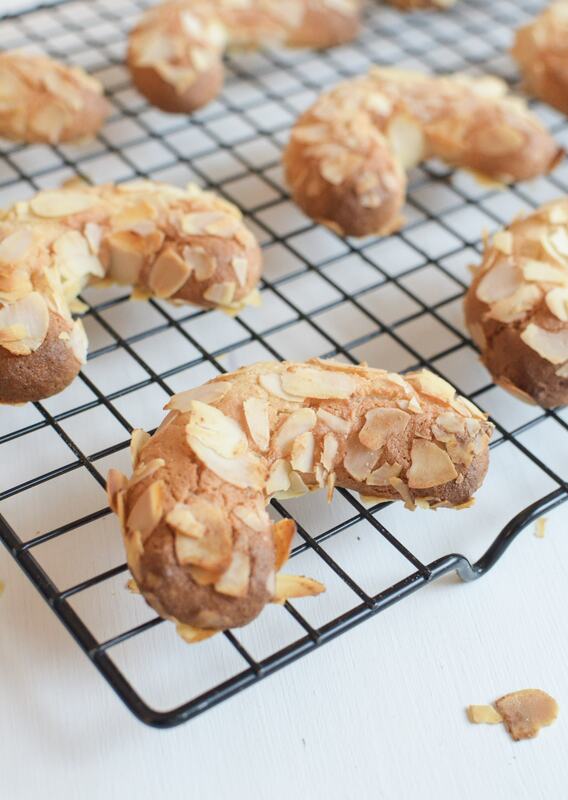 I like to make my almond horns in tea cookie size, but you can make them larger if you like. Just remember to adjust the baking time. When the biscuits are coming out of the oven, give them time to cool down a little, before transferring them to a wire rack. If you handle them too warm, the delicate almonds on top will break. 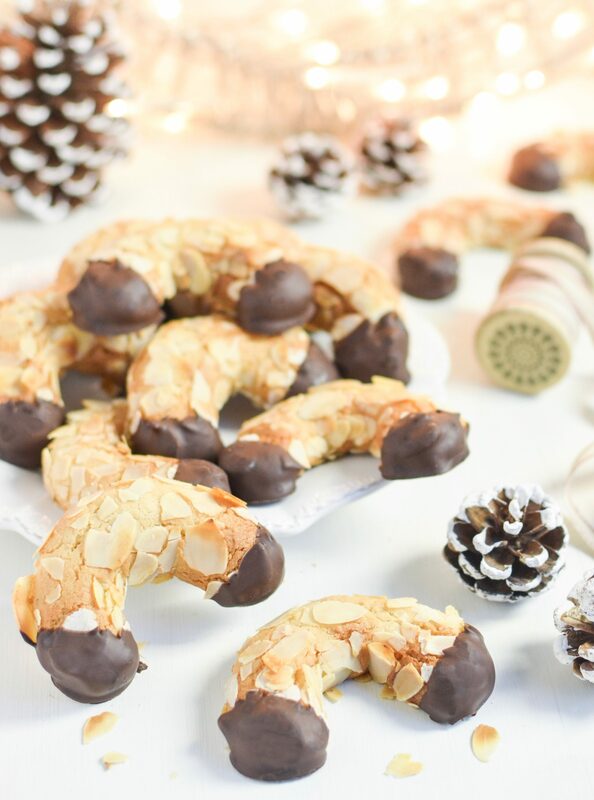 Dip the ends of the almond horns into melted chocolate, and enjoy your lovely Mandelhörnchen or offer them as gifts to your loved ones! Do you have a tradition to bake biscuits for the holidays, if yes, what kind do you make? Drop me a note in the comments, I’d love to know what delicious bakes you prepare for the season! A traditional Christmas cookie recipe, featuring almond paste. Crispy on the outside, moist and chewy on the inside, these almond horns are naturally gluten free. With this recipe you can bake about 18 cookies. Place the almond paste, ground almonds, powdered sugar, grated tonka bean, honey and egg whites in a mixing bowl (or in the bowl of a food processor with the paddle attachment in place). Knead the mixture until it comes together in a sticky dough (if it’s too sticky, add a little more ground almond to it). Line a baking sheet with parchment paper. Sprinkle the slivered almonds to a plate. Scoop about 30 grams of dough. With slightly wet hands form the dough into a ball then roll it in your palms into a short log. Roll the log into the slivered almonds, then shape it into a crescent. 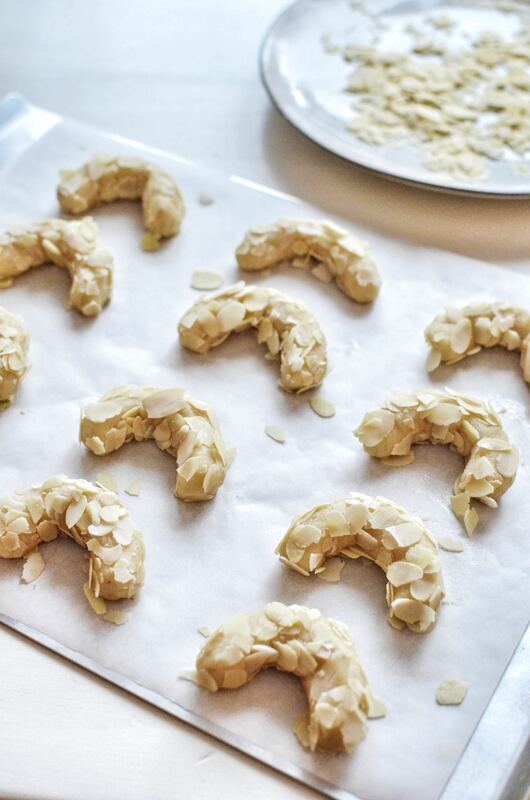 Place your almond crescents on the baking sheet. Bake about 15 minutes until lightly brown. Take out of the oven and let cool down for 10 minutes. Remove carefully the crescents from the baking sheet (the almonds are fragile) and place on a wire rack to cool down entirely. 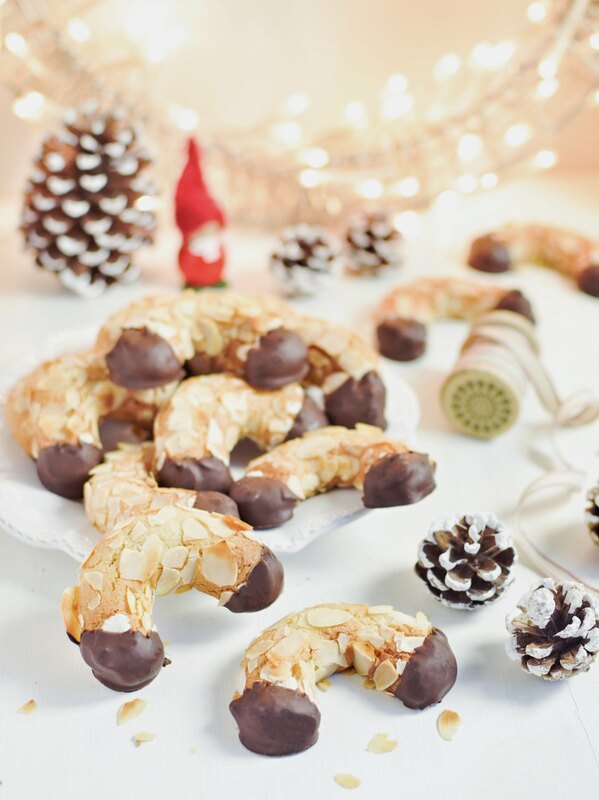 Melt the chocolate in a bowl and dip the ends of the almond crescents into it. Let dry on parchment paper. Store in a metal cookie box. Enjoy! Une recette de biscuits de noël en forme de 'cornes' ou croissant, à base de la pâte d'amande. Croustillant en surface, moelleux à l'intérieur, et naturellement sans gluten. Avec ces quantités vous pourrez faire environ 18 biscuits. Placer dans un large bol la pâte d'amande, la poudre d'amande, le sucre glace, le miel, les blancs d'oeufs et la fève tonka grattée (ou dans le bol de votre robot avec la feuille). Mélanger le tout jusqu'à obtenir une pâte homogène, un peu collante. Préparer une une plaque recouverte de papier sulfurisé. Parsemer les amandes effilées sur une assiette. Prélever un peu de pâte (environ 30g). Avec les mains légèrement humides, former une boule en roulant la pâte entre les mains, puis former un cylindre. Rouler dans les amandes effilées puis former un croissant. Placer les 'croissants' sur la plaque recouverte de papier sulfurisé. Faire cuire pendant environ 15 minutes, jusqu'à ce qu'ils soient dorés. Laisser tiédir 10 minutes puis transférer délicatement sur une grille pour refroidir. 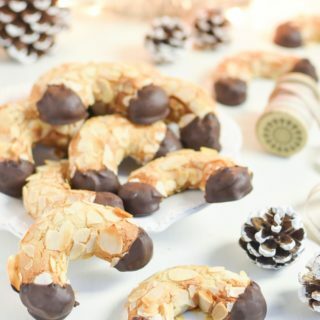 Faire fondre le chocolat (au bain-marie ou micro-onde) puis tremper les extrémités des biscuits. Laisser sécher à température ambiante.